It was wonderful meeting so many of you at Preview last week! We hope you all had a great time. We’ll be sharing a couple more posts this week. Whether you are already committed or still on the fence, we hope you find them helpful and interesting to read! From the very start of my medical school application cycle, I already had many compelling reasons to consider Penn as my top choice school. However, one of the features that really stood out to me from the interview day and Penn Preview was the degree of interaction I observed between students and the faculty and staff. Think back to your stops along the interview trail: at how many schools did you see students just freely pop in and out of the main administrative center, chat up the directors of academic programs and admissions and financial aid, and even pick up personal packages and a few Tootsie pops on the way out? (On that note, the new Suite 100 looks positively fabulous—as does just about everything else in our shiny new building.) These sorts of interactions capture the active dialogue between us students and the professors who teach us. It may sound cliché by now to hear students at different schools hyping up student evaluations, but that input really does matter and make a difference here at Penn Med as the faculty work to refine the curriculum from year to year. This point is especially easy for me to appreciate as an MS1 Course Representative. Every week five of my classmates and I sit down for lunch with Dr. Goldfarb, the Associate Dean for Curriculum, the directors of the courses for the current block, and curriculum development staff, to relay feedback we have received from our classmates about the lectures and small groups for that week. We discuss during the meeting what could be done to resolve any significant issues and to improve the course for next year’s class. Just as medicine is an ever dynamically changing field, medical education remains a progressive effort. In this effort, Penn Med administrators clearly value our role in relaying feedback from students. I have definitely appreciated the respect and attention that our professors have shown us during our meetings and their receptiveness to our feedback. The smaller improvements we suggest often are implemented immediately, while more expansive suggestions get incorporated into planning for the coming year (that means your class stands to benefit hopefully!) One director even took the time to meet with me for two hours one-on-one so that we could discuss suggestions I had developed and collected from classmates on how to improve his course for next year. This level of commitment isn’t just unique to him though; many course directors regularly organize focus groups to examine our feedback and online student evaluations and incorporate suggestions into the planning for the following year. It has truly been a gratifying experience, not only to work closely with our professors who are such interesting individuals, but also to serve as a liaison for our class to make sure our voices get heard and make an impact in our year and beyond. All this said, with our accelerated preclinical curriculum having been implemented for well over a decade now, there really isn’t all that much left we can complain about as Course Reps. But which medical student would say no to a free lunch every week? Lawrence is an MS1 at Penn who hails from Irvine, California, and graduated from Princeton University in 2014 with a degree in Chemical and Biological Engineering. He has keen interests in health policy, particularly with respect to healthcare access and disparities, and the psychology of giving and burnout with the medical field, as well as a current inclination toward pediatric oncology. In his free time, he enjoys going to the gym, watching movies, reading, and playing way too much table tennis in the student lounge. Penn Preview starts tomorrow! We are all so excited to meet you and to show you how great Penn Med is! But we also hope to give you a little taste of what it is like to live in Philly. 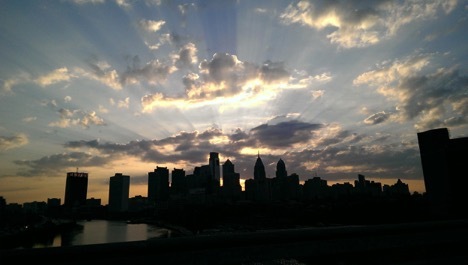 In addition to a panel tomorrow on living in Philly (and of course the numerous conversations you will likely have with current students) we have a great piece today written by an MS4 on her experience living in this wonderful city. As someone who had spent a few years between undergrad and medical school, one of the things that I looked for when I was applying to medical school was one where most of the students lived off campus and not in a dorm. While living in one big building with classmates is probably fun and convenient (…college anyone?! ), I was ready to put the days of common bathrooms (bringing keys with me to take a shower) and kitchens (mystery gunk in shared kitchenware) behind me. Penn Med is a place where some students opt to live on campus as residential advisors to undergraduates, but the vast majority live in the West Philadelphia or Center City area, in apartments or houses that they find on their own. The initial process of finding a place can be tough, as it always is when moving to a new city (or even within the same city! ), but once everyone is settled in, it’s a really wonderful culture. Philly is a very navigable city. A lot of my friends use buses and trolleys; I ride my bike, or I walk. Nearly all my classmates and friends live so close to me, popping by for dinner or meeting up for a study session is extremely easy: my local cafe is also their local cafe (not to mention the five other local cafes as well), and no one’s house is more than a 15-minute bike ride away, max (usually a 5-10 minute walk). I also love that even though I live across the river from the school, when I walk in my neighborhood, I’m bound to run into a familiar face. Living close to each other but off campus means that most of us need to commute to school. I live about a 25-minute walk from the main campus, and I usually cycled to class and hospital rotations during my time here. Even when I was slogging up the South Street Bridge hill in the early mornings to head into the wards, I would inevitably be joined by classmates also going into work, which brightened those dark commutes ever so slightly. There are a few important things I learned over the last four years: camaraderie is a powerful consolation at 6:30am…or 4:30am. And an hour later, the most powerful consolation is coffee. Lately I’ve started walking to and from school more, and I’ve found that it’s the perfect way to catch up with friends, while also getting to see the stunning clouds above the Philadelphia skyline — not a bad way to start or end the day. My sense of home and community reaches beyond the boundaries of the school campus, and as someone who moved to Philadelphia without any friends or family here at first, this environment has been one of the most enriching aspects of my med school experience. Kay Negishi is an MS4, originally from northern New Jersey. She graduated from Harvard in 2007 with a degree in Biology. You can usually find her plodding along the Schuylkill River trail in running gear or drinking coffee while watching clips of Jimmy Fallon’s Tonight Show. Happy Monday everyone! We are super excited to see you all at Preview in just a few days. As you are preparing to make your journey to Philly, and thinking about its potential as your future home, you’re probably wondering, where are the best places to get food? Luckily, MS1 Olivia Bernal has these great recommendations. As you prepare to move to Philadelphia and settle into this great city for the next 4+ years, one of the many things you should start getting excited for is the amazing restaurant scene Philadelphia has to offer! Having lived here for six years, I can honestly say that the food in Philly is one of my favorite things about this city. In addition to boasting a diverse variety of cuisines, there are also countless affordable options that spare the bank without sacrificing quality. Furthermore, and arguably most importantly, Philadelphia is home to the BYOB restaurant. Short for “Bring Your Own Bottle”, BYOs (as they’re fondly called), allow you to bring your own bottle of wine (and sometimes beer and liquor) to enjoy with your meal, usually without any additional fee. While I am certainly no expert or critic, I will provide you with some of my favorite places to eat in Philly. And as I continue to eat my way through this city, I am always willing to offer a suggestion or take a recommendation for a new place to try! Honey’s Sit N’ Eat: Conveniently located on 21st and South, Honey’s offers the best early morning breakfast eats. Come between 7-9 am on weekdays, and for $5 you’ll get your fill of 2 eggs any style, toast, potatoes (latkes, grits, or home fries), and unlimited coffee. Get the latkes with applesauce. Trust me, your taste buds will thank you. Additionally, Honey’s is BYO, so bring some champagne and friends for a boozier brunch experience. Pub and Kitchen: For a classy, casual brunch experience, I’ll go to Pub & Kitchen. Located on 20th and Lombard, Pub & Kitchen offers fresh and flavorful food options. On warm, sunny days, I opt for their outdoor seating along 20th street. Their sausage and scallion biscuit redefines breakfast sandwich. Giorgio on Pine: Located on 13th and Pine, Giorgio is my go-to BYO. In my opinion, you will find the best, most-authentic Italian food here. As an added treat, Giorgio himself will almost certainly stop by your table to say hello. So Crepe: I stumbled upon this gem last year while strolling down South Street. With a simple menu and delicious ingredients, I was smitten immediately. I brought my French roommate with me, and she too loved the crepes and attested to their authenticity. With a bottle of wine, enjoy their savory crepes and indulge in their “So Simple” sweet crepe. Garces Trading Company: Owned by Chef Jose Garces, Garces Trading Co. serves dishes that feature Spanish, Italian, and French influences. First recommended to me by a Philly friend, I took my family to Garces Trading Co for one of my college graduation dinners. It immediately became a family favorite. Dare I say it’s my favorite restaurant in the city? Jamonera: This small, trendy tapas and wine bar offers a hip atmosphere and amazing tapas. With mouthwatering vegetarian and meat-lover options, everyone will leave satisfied. Personal anecdote: I am notoriously known to refuse to eat olives…I couldn’t get enough of Jamonera’s olives. Every winter and fall during restaurant week, restaurants that may typically be out of the budget range of a medical student offer three-course dinners for only $35 per person. In addition, many participating restaurants also offer a three-course lunch for $20. Amada: I love tapas and Chef Jose Garces. Amada combines both of my loves in this beautiful Old City restaurant. I recommend coming here with a group so that everyone can order and share Amada’s impressive selection of tapas. For my fellow cheese-lovers, order the aged manchego with truffle lavender honey. Alma de Cuba: Alma de Cuba features some of the most aesthetically pleasing décor in the city. Step inside and you’ll feel as though you’ve been whisked away to Havana. Their food does not disappoint either. The ceviche was perfect, and the coffee with coconut milk will make even the most stubborn coffee snobs rave. I hope this sampling of restaurants gets your mouth watering for Philadelphia! Med school is great, but life is not fulfilled without good food. Olivia Bernal is an MS1 from Northern California. She graduated from Penn in 2012 with a degree in Biological Basis of Behavior. In her free time she enjoys napping, sipping tea, listening to music, and frequenting Philly’s BYOs with friends. We were in the depths of the most grueling exam period of Mod 1 – the ominous three-day stretch that sat between us and Thanksgiving break. The administration had even warned our parents about this particular set of exams during orientation, telling them that this was going to be one of the hardest weeks of our first year and to make sure we were eating and sleeping and in good spirits. But instead of thinking about epidemiology, microbiology, immunology, and anatomy (those darn cranial nerves that you’ll learn to love and hate soon enough! 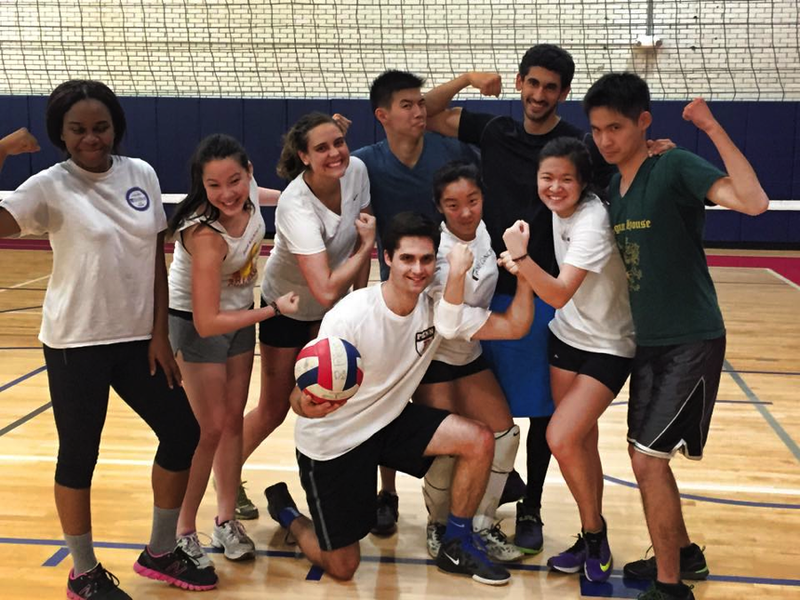 ), the Penn Med intramural (IM) volleyball team was focused on one thing – winning the IM volleyball playoffs. We had suffered only one loss the entire season, and it was to the Penn Dental team, Drill ‘n Kill. Our one chance at redemption was to make it to the championship round to face off with the Dental team again, and we were hungry for that victory. Playoff game #1, the night before the microbiology and immunology exams, was an easy win over a psychology grad student team. Game #2, the night before the big anatomy exam, was a slightly more challenging win against an undergraduate engineering team, but we pulled through unscathed and ecstatic that we were going to the championships!!! The championship match against the Dental team was a white-knuckled roller coaster. They pulled ahead early on with a run of hard serves in the first game, a lead we weren’t able to overcome. In the second game, we regrouped and pulled our secret weapon, Greg, our towering and unparalleled middle hitter, to the front row to put the ball down. We drove forward with a few serving runs of our own, and were leading by three or four points for much of the game. In the end, they caught back up with us, and in “overtime” managed to snag the win from us 25-27. It was an exhilarating game and as satisfying as a loss could be, knowing we had fought our hardest and left it all out on the court. I had assumed that my volleyball days were over after playing throughout middle school, high school, and club in college. But the IM spirit is very much alive and kicking at Perelman, with many MS1s participating in IM soccer, football, ultimate Frisbee, and of course volleyball (just to name a few). The IM volleyball Spring league began March 18th, and you can bet the Penn Med Gun Show is faster, stronger and better than ever. Jessica Dong is an MS1 who calls many places home, including San Francisco, CA; Rockville, MD; and Naperville, IL. Jessica graduated from Dartmouth College in 2012 with a degree in Biology and a minor in environmental studies. Outside of school she enjoys running, frequenting farmer’s markets, cooking, and traveling. At Penn Med you will find no shortage of volunteer opportunities. We previously published a piece on a student-run clinic, Heart Health Bridge to Care. Today, another MS1 shares her experience volunteering for Covenant House, a youth homeless shelter. One of the things that was most important to me in choosing a medical school was the opportunity to participate in community service and work with the underserved. At Penn Preview last year, I boarded a bus with some of my now-classmates to visit Covenant House, a homeless shelter for youth in Germantown, Pennsylvania. We toured the shelter and heard about the services offered by the many wonderful people who work there. What made the day most memorable for me was one young woman’s story. This young woman shared that she had lost her father at a young age and that her mother was addicted to PCP and unable to take care of her and her siblings. She therefore had to support her younger siblings herself. Despite being homeless and having faced numerous obstacles and difficulties in life, this young woman was dedicated to making a better life for herself. She worked, went back to school and is now living independently and doing very well. After my experience hearing from this inspiring woman at Covenant House that day, I knew I wanted to become involved with the organization and the amazing young people there. This fall, I became a regular volunteer at Covenant House. Each Wednesday, a group of volunteers goes to Covenant House and holds an activity night for the residents. Our activity nights have included cupcake decorating, painting and music, writing and theater workshops, game nights, exercise classes, and more. I am so inspired by the resilience, hope, and dedication of the young people living at Covenant House People who have been through incredibly difficult circumstances are cracking jokes to make me laugh . Suddenly, my own “problems” are put into perspective. In addition, many of the young people at Covenant House are talented artists and poets, creating amazing and moving art. I’m now one of the student coordinators for Covenant House. This means that in addition to planning activity nights on Wednesdays, I am able to shadow in the clinic at Covenant House on Fridays. Dr. Ginsburg, who leads the clinic, at Covenant House is an inspirational physician who provides the kind of care that I hope to one day provide to those in need. It’s wonderful being able to watch him interact with his patients and observe how he is able to make them feel safe and cared for despite their past experiences. Dr. Ginsburg trains his residents and medical students to not only present a patient’s medical complaint to him, but also to state what they love about a patient. He has emphasized to us that you may not always like your patients, but you can find something to love about them. When Dr. Ginsburg comes into the patients’ rooms, he warmly addresses them, and the faces of previously reserved patients light up. While shadowing, I am also privileged to hear patients’ histories and stories and learn about their lives. Their stories often involve harrowing accounts of abuse, violence and neglect, but their strength in the face of these injustices is truly staggering. I’ve unfortunately also seen the limitations faced by those who want to help the underserved. Limited supplies, medication and resources mean that creativity is sometimes needed to make sure patients receive the care they require. For example, one patient who required an antibiotic received a different regimen than she may have received elsewhere because it was all that was on hand. Another patient received an antibiotic shot even though there was a risk of an allergic reaction, and needed to be monitored for anaphylaxis. Again, this was due to the fact that only certain antibiotics were on hand, and the infection was a more pressing problem than the small risk of an allergic reaction. One does not often see these types of decisions being made at a large academic center like Penn with much more plentiful resources. Nevertheless, it is wonderful to see that despite facing limitations, it is possible for motivated people to provide great care to those in need. My visits to Covenant House have been what I consider to be some of the most important and formative experiences of my time so far at Perelman. The incredible residents of Covenant House have solidified my desire to provide care for marginalized populations in my future career. I don’t believe that anything could be more fulfilling or rewarding, and I am so happy to have been able to be involved with Covenant House. Abby Robinson is an MS1 originally from North Canton, Ohio. She graduated from Cornell University in 2013 and spent a year providing HIV testing and counseling in the ER of the Jacobi Medical Center in the Bronx before beginning school at Perelman in 2014. In her free time she enjoys running, baking, bad reality television and spending time with friends. It is no surprise that med school involves a lot of studying. But that doesn’t keep Penn Med students from getting involved in amazing initiatives outside of school. 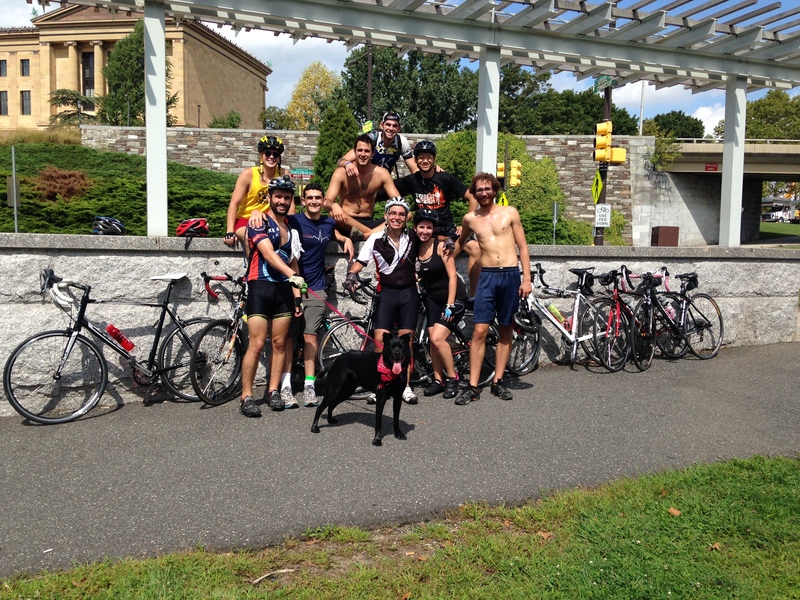 Last fall, a group of Penn Med students went on a 150 mile bike ride…the weekend before our first anatomy exam. My eyes were fixed on the saddle of the bike in front of me and all I could hear was the persistent humming of the tires on the road. Our tires inched dangerously close as we tried to maximize draft in the paceline. The hard work we put in weeks before was finally paying off as we flew down Martin Luther King Junior Drive pushing thirty miles per hour. It’s hard to believe that just that morning we were in the anatomy lab searching for the epiploic foramen. My teammates and I were training for the Philadelphia Ride to Conquer Cancer benefiting Penn Medicine’s Abramson Cancer Center. 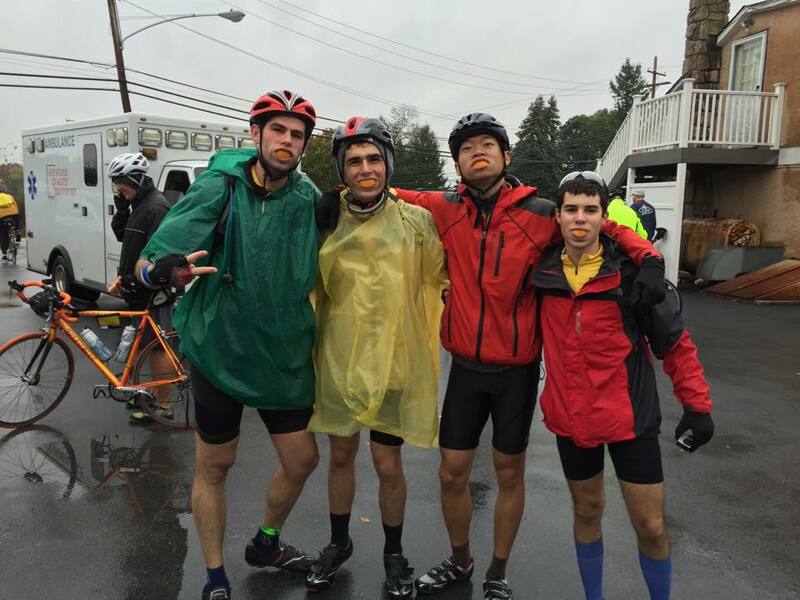 The 150-mile bike ride took place over two days: October 11th and 12th 2014. Each of us raised upwards of $1,500 for cancer research. The fierce Penn Med student team included Emily Martin, Benjamin Emert, Elliot Stein, Robert Schwab, Tom Liu, and myself. Although we were only two months into our 1st year of medical school, our time together in preparation for the ride made it seem like we were old friends. The early hours of Saturday, October 11th were cold, wet, and windy. I don’t think the conditions could have been any worse for a bike ride. But we reluctantly pulled ourselves out of bed and made it to the starting line by 6AM. The first leg of the course was treacherous to say the least. Some of us arrived at the first rest stop bleeding and with our bikes in pieces. But this was only a small road bump for the fearless student team. Ben endured the rest of the ride with his road bike turned into a “fixie,” with only one gear to crank on. Tom pushed through the road burn on his leg (after fainting, of course). We trudged our way through the first 75 miles of the event and finally made our way to base camp as the sky cleared and the sun came out. My body was utterly exhausted and I wondered how I would make it to the finish line the next day. After some warm showers and copious carbohydrates, the Penn Med student team retired to one of the tents to study for an upcoming anatomy exam. We awoke early the next morning with ice covering our tents. Thick fog hovered over the baseball field that had served as our camping grounds for the night. As the sun rose over the trees and began to warm our faces, the excitement fluttered through the air. In stark contrast to the prior morning, Sunday held the perfect conditions for a long distance bike ride. We set off through the farmland west of Philadelphia and made our way back towards the familiar city. The course became increasingly difficult as we crossed over the Appalachian foothills and encountered steep grades that required the lowest of gears and unlimited endurance. In the end, we crossed the finish line in Philadelphia with the crowd cheering, a smile on our faces, and jelly for legs. Overcoming this physically and mentally challenging event as a team put medical school in an interesting framework. With the ride conquered, we stepped into the classroom looking for the next challenge. Want to see more? Check out this video. Anthony Martin is an MS1, originally from the Miami, Florida. He graduated from the School of Engineering at Penn in 2014, majoring in Bioengineering. On his free time he enjoys sleeping, photography, bike riding, and watching quality films. Last week, MS1 Andrew Becker shared his experience getting involved in research at Penn Med. Today, MS4 Melody Xu reflects on her research experiences over the last five years. When I was deciding where to go for medical school, the availability of research opportunities was not a top criterion. I took it for granted because I figured that I would be able to find some type of research project in some department anywhere if I searched hard enough. Yet, as I look forward to graduating with an MD and Masters in Translational Research (MTR) in a few months, I am grateful for the wealth of engaging research projects I’ve found at Penn over the past five years. Most importantly, I am grateful for the culture of mentorship at Penn that allows medical students to easily connect with any faculty or resident as our interests evolve over time. Some research projects are self-initiated. For a global health course I took in the first semester of medical school, I started a research paper on cervical cancer screening in rural China. As part of this study, I stumbled upon the website of an organization supporting cervical cancer screening in rural India. To my surprise, I discovered that a resident at Penn was involved in this work as a medical student! I reached out to her via email, and was easily able to set up a meeting. We have been working together on global oncology projects ever since. Sometimes research projects find you instead. About two years ago, I received an email recruiting students to help with a pilot standardized patient program for resident education. It was a project marked by “firsts”: my first time writing an IRB protocol, first experience designing a research study, and first time working with a statistician. I am thankful for my mentors who found me and, through their patience, taught me to approach each element with methodical (and efficient) care. Though the original project has come to a close, we have continued our productive partnership, writing and organizing events together to improve medical education. When I was ready to pursue research as a full-time year-long commitment, I found an abundance of resources at Penn. The Penn year-out website led me to a research mentor who was developing a novel translational technology in oncology. Our project proposal was formulated within two weeks. By the time I began preparing to apply for outside fellowship funding, an invitation to apply for Penn’s MTR program popped up in my inbox. (Perfect!) The year-out was a formative experience. Under my research mentor, I experienced a healthy blend of autonomy and guidance to grow my lab competency. Through the MTR program, I gained exposure to the challenging, yet meaningful, process of translational research that strongly shapes my career goals today. Penn offers medical students an incredibly vibrant research environment. Our administration is infinitely supportive and anyone who is open to research will undoubtedly find an outpouring of invitations from fellow medical students, residents, and faculty. I hope you choose to join us at Penn Med to experience all that we have to offer! Melody Xu is an MS4, originally from the San Francisco Bay Area. She graduated from UC Berkeley in 2009, majoring in Molecular and Cell Biology. In her free time, she enjoys playing volleyball, biking, and discovering new snacks at Trader Joe’s.